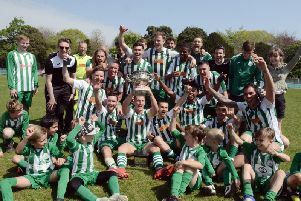 A late Scott Jones goal handed Chichester a 2-1 victory over Horsham YMCA, helping Miles Rutherford’s side preserve their 100 per cent record in the SCFL premier. Like Chi, the visitors had won their opening two league games. When the teams met at Oaklands Park last season, the match ended 1-1 and this proved another close encounter. After the disappointment of the FA Cup exit, Rutherford made changes to the starting XI. Kieran Hartley came in for the injured Ellis Martin and Jimmy Wild and Rob Hutchings joined Jones in attack. Chi forged an opportunity when Wild beat the offside trap but the Bath University-bound striker couldn’t square a pass to a team-mate. YM’s Tony Nwachukwu blazed his shot over from six yards, only for an offside flag to spare his blushes. The visitors might have scored from a corner in the next passage of play but Guy Harding’s header was off target. The hosts went ahead in the 27th minute when Wild got a touch to a Dan Hegarty cross. Aaron Jeal parried but Jones was first to the loose ball and slotted it in from close range. Chi’s back four of Hartley, Connor Cody, Ben Pashley and Terrell Lewis had to keep their wits about them in this spell. A knockdown from Harding was smuggled away, then Ollie Gill flashed an effort over. Lewis recovered well after an awkward first touch almost let in Alex Barbary. In the second half, Luke Donaldson came on for Gill at the break and had the first chance of a scrappy second half after Wild lost the ball. The home side lost Hegarty with an injury – Matt Axell slotting into his position in midfield on his debut. Hutchings had another go without troubling Jeal before YM hauled themselves level when a fierce Dan Mobsby shot from some distance went into the bottom corner off the post on 68 minutes. A couple of minutes later, the visitors’ Tony Garrod’s free-kick lifted narrowly over the bar. Pashley cleared another set-piece before an errant header back to Matthews from Lewis was almost intercepted. Rutherford, who replaced Hutchings with Tiago Andrade, brought on Sam Ndlovu for Dave Herbert with five minutes to go. A bit of trickery from the Chi winger helped set up Hartley whose shot fizzed just past the post. Jones, City’s top scorer last season, got on the end of a delivery from Wild with the winner in the 88th minute. There was still time for other chances. YM went close in the third minute of added time when Harding smashed a shot against the bar and at the other end, Andrade almost capitalised on a mix-up between Jeal and Ash Dugdale. Chichester: Matthews, Lewis, Cody, Pashley, Hartley, Way, Jones, Hegarty, Dave Herbert, Wild, Hutchings. Subs: Steve Herbert, Ndlovu, Callnon, Axell, Andrade.